Hope it will go away! Try some D.I.Y. mole control or attempt to scare it away. I cannot blame anyone for trying these options first, as a mole catcher I’m bound to recommend a different course of action aren’t I? Well let me explain why I recommend your first course of action is to phone an expert mole catcher. This may happen but its very rare, if a mole has moved into your garden or onto your property then he is trying to expand his territory or he is a young mole looking for an area of his own. Now as you would expect digging all those tunnels is hard work, moles don’t want to spend any more time opening new territory than they need to so if you give a mole a chance to undermine your garden or land then even when you remove him you still have mole tunnels and runs ready for another mole to move into. The sooner you stop a moles underground tunnelling the sooner you make sure your garden wont become an attractive mole habitat in the future. Catch a live mole traps-Please DO NOT try to use ‘humane mole traps’ of the catch alive trap variety. Moles have a very fast metabolism, they need to eat at very short intervals so a mole trapped in a sealed tube stands a very good chance of starving to death in a very short time. Moles are also very territorial and to release a mole in any other area is also going to lead to our blind little man in black velvet having a very troubled time. Remember, just because you cant see any mole hills it doesn’t mean its not another moles territory. Traps bought from your local garden centre- Traps that are bought for under £8 from garden centres are certainly cheap traps imported from abroad, the springs in these traps are not strong enough to kill a mole humanely, sometimes they aren’t even strong enough to hold the mole in the trap leading to moles that are very trap aware and will take extra time and effort to catch and remove. 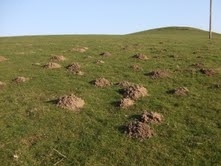 Try and scare the moles away- There are many old wives tales about how to scare away moles, from planting windmills and burying bottles to tipping all sorts of poisons and chemicals down poor old moley’s holes. About 9 out of 10 of my domestic clients have tried to scare old moley away, from the cheap D.I.Y. options to expensive ‘ sonic ‘ mole scarers and they simply do not work. You will often see moles right alongside duel carriage-ways, if they can stand the constant noise of lorries and cars they certainly don’t mind a vibrating ‘sonic mole scarer’. I would also wonder at the sense in trying to be ‘kind’ to a mole by pouring chemicals such as Jeyes fluid down tunnels and into mole hills, quite apart from damaging your lawn more than the moley himself, your little friend the mole will simply shut off that part of his tunnel system and set to work digging even more elsewhere in your garden. 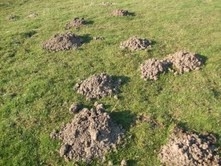 The best course of action is to call a professional mole catcher using traditional mole catching techniques to remove the mole quickly and humanely. I offer a quick cost effective service, please feel free to call for a quote or even just for some free advice, I’m always happy to talk about moles and the options open to you. Moles can be one of the most expensive pests to deal with in the agricultural environment, so I pride myself on my ability to tackle serious mole control over large areas. 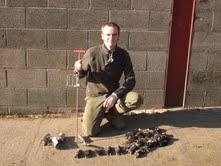 The methods I use combined with my extensive experience, enable me to deal with mole problems in such an efficient way that I am now one of the cheapest traditional mole catchers operating in Lancashire and the North West. I started my pest control career controlling moles and have constantly studied moles and their control since I first started following my father across the fields. I have also worked in and around agricultural environments all my life so understand the constraints of the agricultural year and how they effect moles and their control. A pay by the mole arrangement. This is usually as little as £5 per mole but does depend on the area to be covered and the density of the mole population. This is my preferred arrangement as it allows both me and the landowner to see how the job is progressing and gives you a confidence that you are only paying by results. PLEASE NOTE- Unless disposal is requested all moles caught are left on the property from which they came to allow landowners and managers to see the on site results. NO MOLE NO FEE.